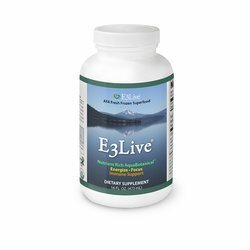 The E3 Live Quick Shake Cooler Cup is perfect for keeping your E3 Live and other drinks, shakes, smoothies, or Ken Rohla's superfood detox tonics cold on the road. In the base you can store your powder or pills to go with your drink, all in one convenient spill-proof cup. The removable bottom cup stores 60 grams of nutritional powder or pills, while the upper cup holds 12 fluid ounces of liquid. The ice wand will keep your liquid cool for hours. Put the ice wand in the freezer for three hours, then pour in your drink and go. E3 Live Quick Shake Cooler Cup, 12 oz has been added successfully to your wishlist. Remove ice wand from inside of shaker by removing lid and pulling out the ice wand from the agitator. Place ice wand in freezer for three hours or until frozen. Place nutritional powder in bottom removable cup. Place liquid in shaker cup. When ready to mix your shake, place frozen ice wand into agitator, remove the bottom cup containing the powder, remove top lid, pour powder into shaker, replace lid and bottom, shake and enjoy! All parts are top rack dishwasher safe except for the ice wand. To clean the ice wand, wipe clean with a warm, soapy cloth, and wipe dry.